Over 140 cars and 200 hungry RMS members, car enthusiasts and friends arrived at Kerr’s Tyres for the first barbecue of the year. We were blessed with clear blue skies and sunshine, and the tyre depot carpark overflowed out on to the main road, it was that busy. The format of the event was still unchanged as ever – free food, arrive and go as you please and a completely chilled atmosphere. RMS has a broad and varied membership and this seems to be reflected in our BBQs. This event was no exception with everything from Warren’s Akrapovič fitted BMW M4, to the Capri Club member’s classic mark 1 cars in concurs condition, there was something for everyone. We hope to continue to run these events throughout 2015 as they seem incredibly popular and a great way of members meeting offline. 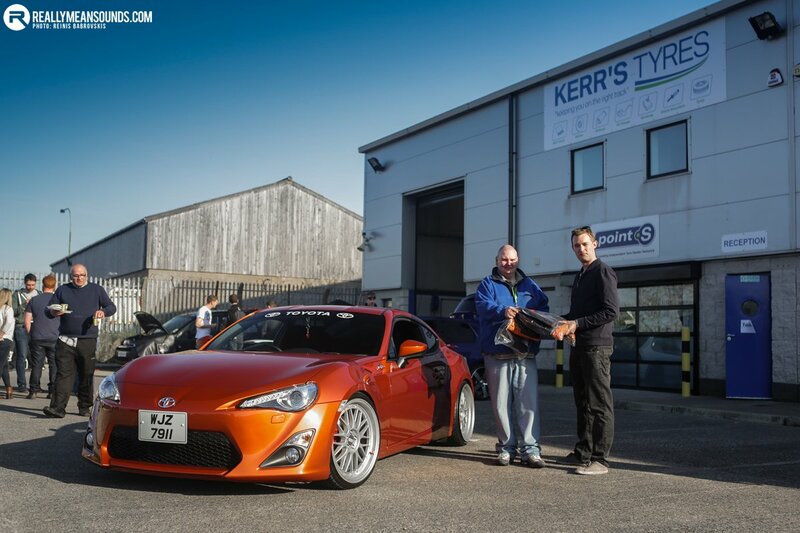 Congratulations to Les in the Orange Toyota GT86 for taking car of the day. Thanks to Norman, Elaine and the team at Kerr’s Tyres (kerrstyres.co.uk) for hosting the event and providing the excellent BBQ for the members and friends. Managed to get a bit of colour on my face, great day for it. Recognised a lot of cars and met a few site members for the first time. Lol awk thanks....highly doubt out of all the nice cars there you'd of taken mine lol @Paul RS your sierra is beaut! Had really meant to do to this but with other things the day got away from me. Stagea was probably my csr of the dday...walked psst it several times. Love those things. Enjoyable day and some very very nice cars about! Those RS6's are getting wild common though :P.. Fantastic machines! Looked a good day, weather was awesome! I decided to go the opposite direction and head up the coast road, was brilliant!!! Called in just after 1:30 and there was a great crowd there already, some very nice cars about as well. Loved the red RS6, M4 and white 911. As usual, I was: A - In church B - In England and most unusually visiting a friend in North Staffordshire Hospital Maybe next time.